Area - The sink bottom actually IS painted. We painted it Ben Moore color White Rain, 708 in a semi gloss. The shower curtain, which is not pictured had a lovely soft green tone in it that we picked up in the underside of the sink to bring all the colors together! Hand Towel - Where is the black and white hand towel from? What color is the paint? Thank you! Love the stool. Where's it from? Hello, love your paint colour! Do you have a window in your bathroom that there is a lot of natural light? love the sink ! What is the brand? what color is the grout? Sorry, we picked the grout on site and I don't have that information for you. Love the contrasting paint. - What colors of blue and white paint did you use? the blue was Ben Moore Newburg Green! It looks amazing in this bathroom! The tile is from Roma Tile, they will have all the specs! The homeowner purchased directly from them. 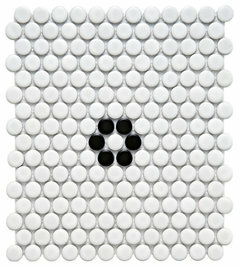 We have a similar tile available on Houzz! Thanks for the compliment, we love the color too! Thanks Connor Homes for answering! Floor - Where i can buy this floor? Thank you! What are the dimensions of the wall tiles? Pictures - Where are the pictures from? https://www.etsy.com/shop/LILAxLOLA?ref=l2-shopheader-name I just printed them at the office and popped them in some Target frames! Towel basket - Where is the towel basket from? Thanks! I found it at Target! what's the faucet brand, design and color? is it the same as the towel bar and toilet paper holder? Wall tile - Would you please identify the size and manufacturer of the wall tile? Thank you. Is the wall tile grout white or light grey, please? It looks grey, but difficult to tell for sure from the pic. Typically bathroom counters are 35" - 36" now (they used to be very low!) This Kohler sink has a specification that states to mount it lower and on all occasions I have felt it was too low, and I am rather short. So I'd say somewhere between 34" - 35" would be comfortable. But just hold up a tape measure and mock it up in your home! Type and size of the tile on the wall - Can you please tell me the type of tile used and the size? Very nice! Thank you. the tile is a 4x12, ceramic tile. The clients purchased the tile directly, so I don't have the spec, sorry! Blue walls - Love the blue wall. Could you please tell me the name of the paint color? if you recall, can you please share where the TP and towel ring brand? - Thank you. I believe they were Kohler, the clients purchased directly and I don't have a paper trail, sorry! Wall color? - What is the wall color? Benjamin Moore Newburg Green, HC-158! White tile size? - What is the size of the white subway tile? Is subway tile matte or polished? - Beautiful bathroom Kristina. Thx for the inspiration! Its polished , you just can't tell! Pictures - Love the bunny on the wall! Where did you get it? Little Wooden Stool for the pantry - Where do I find the little wooden stool for that in picture in this bathroom? The stool is from Serena & Lily, it comes in a few colors. Tile Size - Are those standard 3x6 tiles? They look larger. Please let us know. It all looks amazing. They are a 3x12, I love the modern take on the subway! Brand/Style of the lighting (wall sconces) please? step stool? - where is the step stool from? Finishing for the subway tile? - Kristina, thanks for answering so many questions so far. I love the bathroom. I was wondering how the top of the subway tile is finished. I can't tell from the photo but is there a bullnose tile on top or does it just end with some grout/caulking on top? Can you also share the grout color? The top of the top tile is a bullnose, so a bullnose on the long edge. Keeping it simple rather than a decorative chair rail! Towel bar and toilet paper holder - Beautiful bathroom. Could you please tell me where the towel bar and paper towel holder are from? Love the prints - Where are the prints from? leepa63 - Paint color please? 8. Oversize sink. If you’re not a fan of water splashing from the sink onto the countertop or floor, you may want to consider a larger basin. 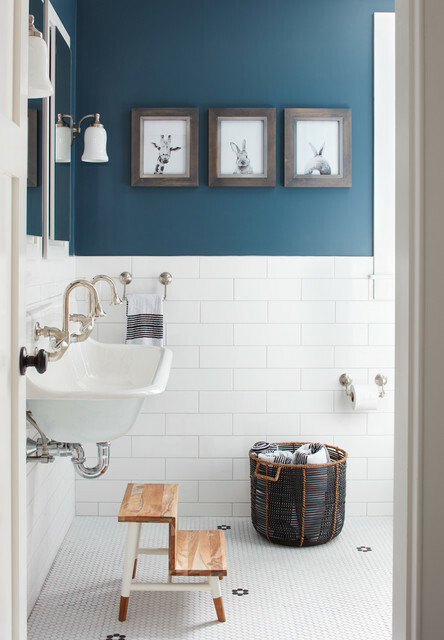 In this stylish Boston bathroom, designer Kristina Crestin selected a 4-foot-wide Brockway sink from Kohler.